Chandigarh Police Department has conducted the Police Constable Examination on 15th, 16th, and 17th November respectively. Many of the competitors wishing to become police constable in Chandigarh have appeared for the examination as per the scheduled dates. This year more than 2 lakh competitors have competed for police constable posts in the state of Chandigarh. The organization has conducted the written test in many examination centers across the state. The organization has conducted the examination and released the answer keys of police constable examination. Candidates competed for the test will have to wait for few more days to check the result. 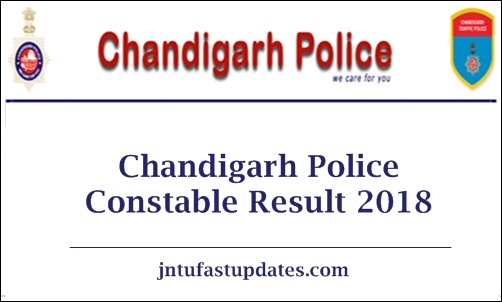 The Chandigarh Police Department will announce the police constable results shortly on its official website, Chandigarhpolice.gov.in. Aspirants competed for the written test can keep checking the website on a regular basis to check the updates regarding the Chandigarh Police Constable result, cutoff marks, and merit list 2018. Chandigarh Police Department works for the safety and security of the citizens of the state. The department annually releases various job notifications to hire the suitable aspirants into various designations. The organization recently issued notification for 520 constable posts. Candidates interested in Chandigarh Police jobs have applied for the Constable posts during the application dates. The department is going to shortlist the suitable aspirants through the written test, physical eligibility test, physical measurements test, medical examination, interview round and document verification rounds. Candidates have to qualify in all the rounds to get shortlisted for the announced posts. Chandigarh Police Department will announce the constable written test result within 3 to 4 weeks after the examination (tentatively). Aspirants waiting to check the results can stay checking the Chandigarh Police Department website, chandigarhpolice.nic.in. The organization will soon announce the result date on its portal. Candidates competed for the Chandigarh Police Constable examination can check results from today . Hence the hopefuls competed for the examination can stay checking the official website on a regular basis to check the result date. Latest News (31.12.2018) : Chandigarh Police Department has Released a Merit List for 520 Constable Written Exam. Download Merit List from the Below Links. The department will announce the cutoff marks of the constable examination based on various factors such as the number of available posts, number of candidates competing for the test, the difficulty level of the examination and various other factors. The cutoff marks/qualifying marks are the marks that are to be scored by the competitors to clear the written test round. Aspirants clearing the exam with required cutoff marks will be listed in the merit list. The Chandigarh Police Department will announce the result, cutoff marks, and merit list at a time. Candidates competed for the examination can stay checking the official portal, chandigarhpolice.nic.in to check the latest updates. Visit the official site of Chandigarh Police Department, chandigarhpolice.nic.in. On the homepage “Chandigarh Police Constable Result 2018” Link appears on the screen.